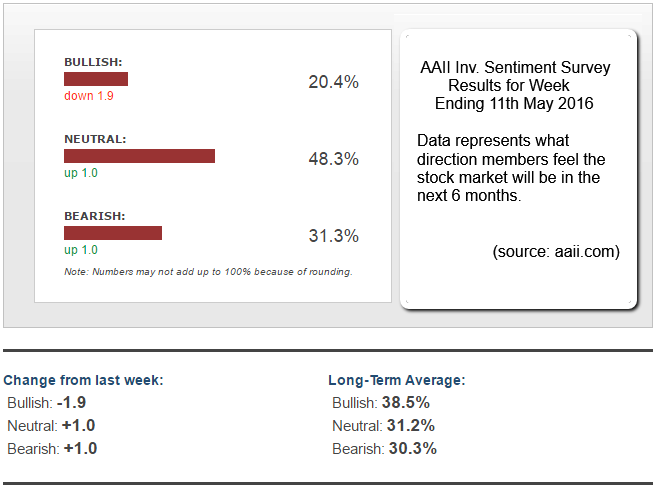 ♦ Bullish sentiment, expectations that stock prices will rise over the next six months, fell 1.9 percentage points to 20.4%. Optimism was last lower on February 11, 2016 (19.2%). 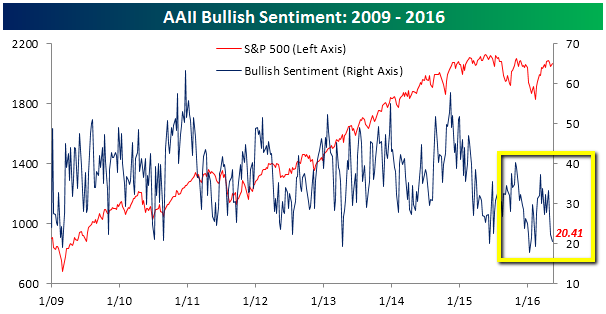 This is the 27th consecutive week and the 60th out of the past 62 weeks that bullish sentiment has been below its historical average of 39.0%. ♦ Neutral sentiment, expectations that stock prices will stay essentially unchanged over the next six months, rose 1.0 percentage point to 48.3%. The rise keeps neutral sentiment above 40% for a ninth consecutive week. It also keeps neutral sentiment above its historical average of 31% for a 15th consecutive week and the 67th out of the past 71 weeks. ♦ Bearish sentiment, expectations that stock prices will fall over the next six months, rose 1.0 percentage point to 31.3%. Pessimism was last higher on February 25, 2016 (31.4%). Bearish sentiment has now been above its historical average of 30% for two weeks in a row. Ever since the S&P 500 index hit a 2016 high on 20th April 2016, optimism has declined by a cumulative 13 percentage points. 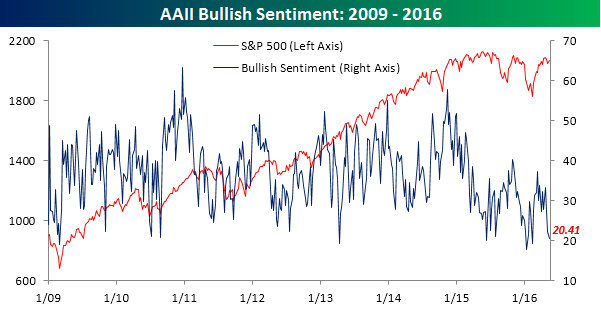 The low level of bullish sentiment is a continuation of an ongoing trend. Fewer than one out of three survey respondents have described their short-term outlook for stocks as bullish during 23 out of the past 26 weeks.